This blog post is different than my usual pictorial based posts. 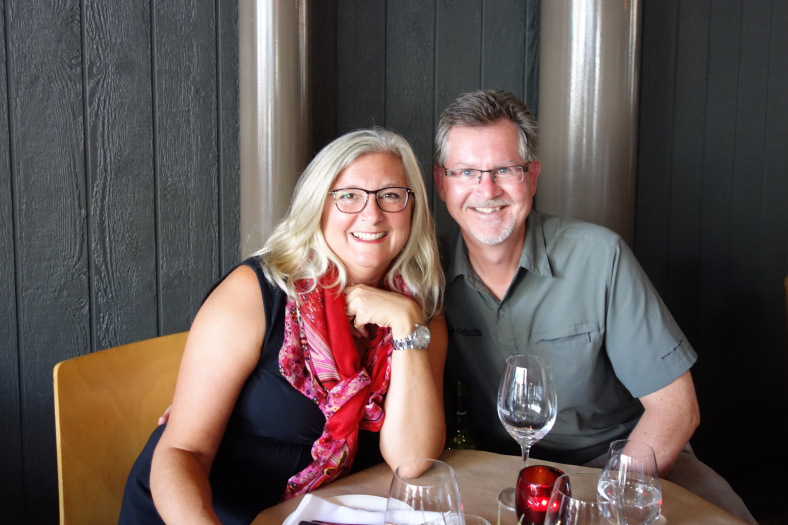 I have been wanting to write this post since I started this blog several years ago. 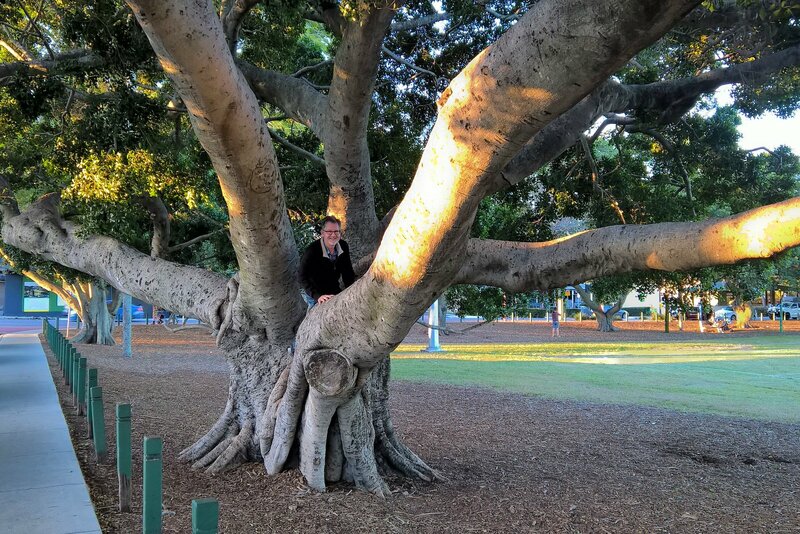 In fact, it was because of these fig trees that I started writing this blog. A story was ignited and it has patiently waited to be told. If you are not interested in bible stories, you might still enjoy this one. I hope you do! 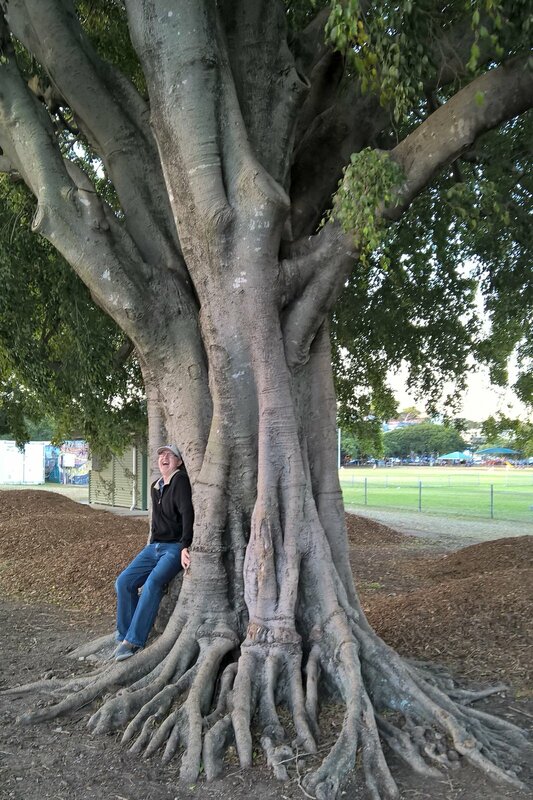 I had never seen a fig tree this size before I moved to Brisbane, Australia. (For one thing, they don’t grow in my part of Canada.) 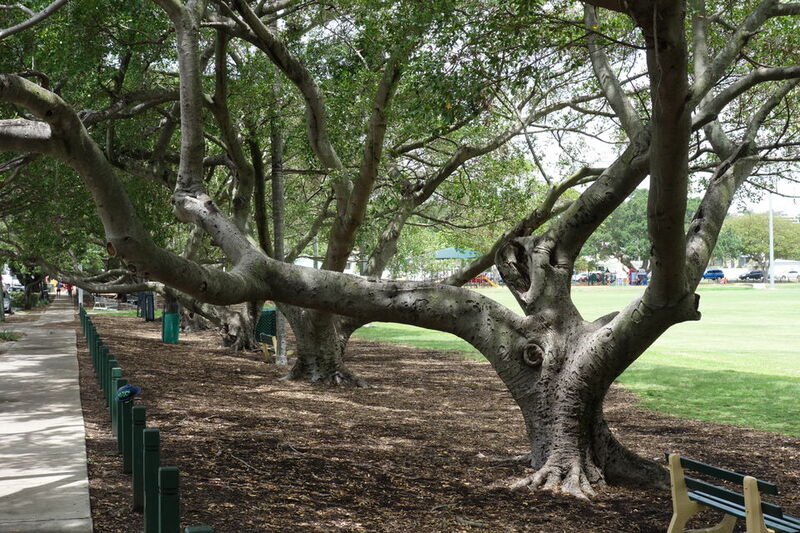 Here in Bulimba, these particular Fig trees line the popular Oxford Street on one side of the Memorial Park, just a few blocks from where I live. The first time I saw them I was shocked that these huge branches did not just break and fall off of the tree. Yet, not only do they support their own weight but the weight of those who climb them. The story that is found in the bible (Luke 19:1-10) is about the encounter that Zacchaeus had with Jesus, Son of God. Jesus had developed quite the following. Everywhere he went, crowds of people gathered to hear what he had to say. He talked about God in a way that was different from their religious leaders. They gathered, as well, because of the miracles of healing that he did. Zacchaeus had heard a lot about Jesus. He heard that Jesus was a prophet, a teacher, a miracle worker, a man of God. He had even heard rumors that Jesus was the Messiah – the anointed one from God. So, Zacchaeus very much wanted to see who this Jesus was – so much so that he put his dignity aside and climbed a sycamore fig tree, probably one very much like we have here. Zacchaeus did this because he was short, and he wanted to see above the crowds. Likely he also did this so that he could hide in the leafy branches. To see but not be seen. It was no small thing for Zacchaeus to do this. He was a Jew and a chief tax collector for the occupying Roman government. He was a very wealthy and important man with an important job. He was also a hated man because every Jew hated the Romans to whom they were subjugated – and therefore they hated anyone who would work for them. Moreover, because taxes were exorbitant and tax collectors were known to add their own high “service fees,” Zacchaeus likely kept a low profile (sorry about the pun) when he wasn’t working. He would not have wanted to draw attention to himself among this Jewish crowd. Sometimes curiosity needs to win out. Sometimes we have to want something enough to risk our pride and our reputation to align ourselves with the opportunity to “see” God. That is what Zacchaeus wanted. Desperately. God saw this – and a divine appointment was made. As Jesus came to the tree where Zacchaeus was hidden in among the leaves, he stopped and looked up. Wow! That is what I like best about Jesus. He did what he wanted to without concern for how it might look to others. Immediately the crowd around him started grumbling and I’m sure that not just a few of them offered their opinion to Jesus. Perhaps they thought that Jesus didn’t know who Zacchaeus was and how hated he was. But, look back. What is the first word from Jesus’s mouth? He called him by name. God sees everything about us – who we are – what we’ve done. And, he is still interested in us. Zacchaeus came down from the tree and rather than being upset because his cover was blown, he was very excited about Jesus dining with him. What was it that he saw in Jesus’s eyes at that moment, do you think? Whatever he saw and heard, touched him to the core. He was so impacted that he dramatically changed his life around. He immediately (no promises here – just action) set about to not only repay those he had robbed, but also to share his personal wealth so that those to whom he had caused suffering would now have a reason to rejoice. He was determined to make amends. Talk about a drama! Talk about an amazing change of heart! This story about Zacchaeus follows closely behind the story of “The Rich Young Ruler.” (Luke 18:18-23) The rich young ruler also had great wealth, but he also had social standing. He was considered righteous and obedient to every Jewish law. He was on everyone’s “A” list. Yet, when he approached Jesus, seeking his approval no doubt, he could not let go of the one big thing that was most important to him. His wealth. Zacchaeus valued an encounter with God as more valuable than money. The Rich Young Ruler wasn’t willing to release control of his wealth and social standing for the opportunity to know God. Every story that is recorded in the bible is there for a reason. Everything Jesus did, he did with intention – to tell us something about God – and to meet the true need of our heart. God has not rejected you. He sees you and cares about you. Your life can change in a moment. What is your tree to climb? Take a step toward God, and I can assure you that he will respond. There seems to be some confusion here. My husband thought that we were taking pictures for a Lord of the Rings story – one with Ents and the Dark Forest. It is a fun picture, and it does feature the fig tree, so there you have it. Another story featuring trees. This blog post is also being featured over at my spiritually based website, “In Light of This.” Visit me over there and say hello. 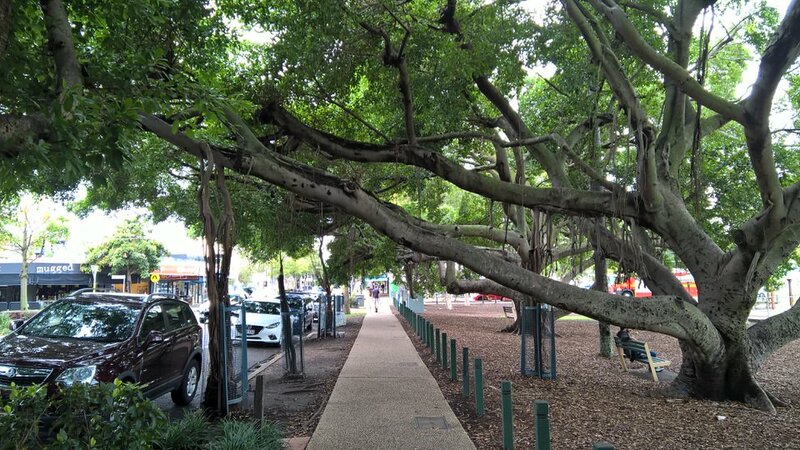 This entry was posted in Our Brisbane Life and tagged fig trees, oxford street, zacchaeus. Bookmark the permalink. Thanks for the reminders Diane. It’s always important to remember that if we seek, climb, look, then Christ will be found. I love the last picture with Ed laughing. LOL about the last picture. Ed was going for the scared look, but we were both laughing, so that didn’t work so well. He is such a good sport.